We are conducting some research on the teaching of Computing and ICT to students with special needs and disabilities in special schools and other settings, by means of a survey (scroll down to complete, after reading the following guidance). The extent to which the 2014 Computing curriculum is being taught in SEND settings. The confidence of teachers in teaching this. The relevance and benefits (or otherwise) of teaching the computing curriculum to pupils with SEND. It also hopes to collect useful resources and strategies for teaching computer science that can then be shared widely. It is being undertaken according to BERA (British Educational Research Council) guidelines. All results will be published anonymously, and participants’ data will remain private – it will not be shared with any third parties. Completion of the survey assumes permission is given to use data for these purposes. The results will be published by Easter 2018, and promoted on social media and the Computing at School community. Computing – refers to the 2014 national curriculum subject, see National Curriculum Computing Programs of Study. Computational thinking – “Computational thinking allows us to take a complex problem, understand what the problem is and develop possible solutions. 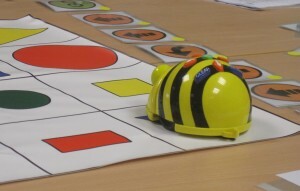 We can then present these solutions in a way that a computer, a human, or both, can understand.” (BBC Bitesize resource, http://www.bbc.co.uk/education/guides/zp92mp3/revision) This includes algorithmic and logical thinking, pattern recognition, decomposition and abstraction. For information about these, there are some excellent resources for teachers at https://barefootcas.org.uk.